You can run from your past but it will always find a way of catching up to you. Lydia works in the Bright Ideas Bookstore, she loves her job and her regular customers. She loves helping people find good books and spending her days in the stacks. Then one day her whole life changes, She finds one of her regulars Joey has hung himself in the bookshop. Lydia was close to Joey but not only this, she is the one who finds him and also when she does he is holding a photo of Lydia when she was ten years old at her birthday party. Where did Joey get this photo from? Why did he have it? As Lydia starts to unravel the mystery Joey has left behind her past comes back to light. When Lydia was a child she witnessed something terrible, a murder. The murderer was never caught, is he back in Lydia's life again? Will digging into Joey's life lead her into danger? 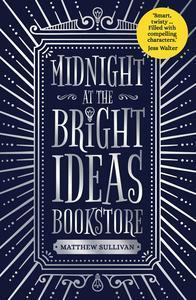 Midnight at the Bright Ideas Bookstore got me hooked just from the title. Once I started reading I couldn't put it down. The book keeps you guessing all the way through has you doubting yourself when you think you know who he Hammerman is an then just when you think you've got it all worked out, it turns everything on its head and surprises you even more. This book is well written, has some wonderful characters in it. The plot works perfectly, it has such a great flow easy to read and all in all a great read. I have chosen to give this book four out of five stars as I would definitely recommend it to anyone looking for a great read.